Frederick Cosmetic Dentist | I Chipped a Tooth! What Can I Do? It usually starts pretty innocently. You’re biting into your favorite hard candy and suddenly you realize that there’s one little hard piece in your mouth you can’t seem to dissolve. You check it out and fear overcomes you when you see it’s a little chipped piece of a tooth. 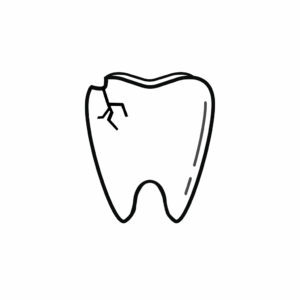 Tooth bonding has many structural uses, and it can be very helpful for repairing chipped teeth. Tooth bonding is a simple procedure that doesn’t require any numbing. The bonding materials and porcelain used are natural in color and can be designed to perfectly match your teeth. Your smile will look good as new, and people will have a hard time noticing you ever chipped a tooth to begin with. A dental crown is a tooth-shaped cap that helps protect your teeth, while at the same time improving its appearance. An AACD (American Academy of Cosmetic Dentistry) dentist will likely use a tooth colored crown made out of porcelain or zirconia to look identical to your teeth. Crowns will also provide the durability and strength your teeth need to withstand daily use. You may only need a partial crown if our dentist sees that the chip doesn’t affect the entire tooth. Porcelain laminate veneers are made up of several thin layers of ceramic used to repair chipped teeth. They will be bonded to the teeth to replace the original enamel of the tooth with a special adhesive. Dental veneers are a fantastic way to get your tooth to look whole and healthy again. If you have a chipped tooth and would like more information on these methods, or to schedule a consultation, contact our office today. Premiere Dental Arts has been recognized as one of the top Frederick Dentistry practices. 21702 Dentist | Should You Brush Right After Eating? WOW! Did you know that like a fingerprint, everyone has a unique tongue print also?! Schedule your next comprehensive oral exam today. We LOVE hearing from our patients! Tell us how we’re doing. Comment below (and/or leave us a review on Google). Contact our office to schedule your next appointment. If you don’t floss, you miss cleaning 40% of your tooth surfaces. Make sure you brush and floss twice a day! Contact our office to schedule your next exam today. Are you having trouble shaking frequent headaches? This may be a sign of an unresolved dental issue. Schedule a consultation with us today.